The L2.1 is said to have evolved from the L2, for many years a mainstay in Lamm Audio’s product lineup. Evolution is generally regarded as inevitable but when starting with the nearly flawless circuitry of the L2 how do you progress to L2.1? Well, attention has been focused on better active and passive devices in key circuit locations, including new PC boards and replacement of electrolytic capacitors in the power supply’s tube voltage regulation section with newly developed high-density polypropylene capacitors of comparable size and value. A measurable result of these updates is an improved signal-to-noise ratio. This is a two-chassis affair, with a separate power supply. I should make it clear upfront that the L2.1 is a hybrid design but not in the usual sense. The power supply is all tube while the audio circuit is solid-state. Isolating the power supply from the audio circuitry is not a new idea but a 19-pound preamp power supply is most unusual. There are power amps out there that weigh less. Let’s take a moment to deconstruct the performance aspects of an ideal power supply. It should be “quiet” and avoid contaminating the signal with high-frequency switching noise typical of conventional solid-state rectifier circuits. Current delivery should be instantaneous over the entire signal bandwidth and without sagging voltage. It should be capable of coping with AC mains voltage drifts and EMI/RFI noise interference. The L2.1’s power supply addresses these aspects and is exceptional in execution: a custom-designed, low-noise toroidal power transformer, RFI filtering, vacuum-tube rectification and voltage regulation, and a choke-based filter. A pair of 12AX3 Compactron-style diodes is used as a full wave rectifier. The voltage regulator circuit uses a three-tube complement: one 12AX7/ECC83, one Russian 6C19, and one 5651A voltage reference tube. DC voltages are locked to the voltage of the reference tube to ensure a stable operating point. It was Audio Research in the mid-1970s that first introduced power supply complexity as a means of coaxing better sound from an audio circuit. This is a correct approach in my view, and any preamp with pretensions to reference status had better pay serious attention to the power supply. No possibility of tube-rolling here. MOSFETs are used in Class A, no-feedback circuitry for the gain and buffer stages. It has been said that tube amps measure poorly but sound good. In the case of solid-state devices good specs are no guarantee of good sound. It’s often the case in the context of high-end audio that measurements conflict with perception. Electronic engineers sometimes confuse the two, insisting that if it measures well it must sound good. Aside from the issues of what to measure and what measurements correlate with good sound, it must be understood that the perceptual and physical domains are distinct. The processing of physical stimuli in our brains is complex and still the subject of ongoing research. Imagine an engineer designing a violin on the basis of measurements and insisting that since its spectral output is identical to that of a Stradivarius that the two must therefore be sonically identical. That just isn’t going to fly past any violinist. The L2.1 is one of those exceptional products that measures well and manages to sound terrific at the same time. As with other Lamm Audio products, it was designed within the conceptual framework that Vladimir Lamm refers to as “absolute system linearity” and that he feels is predictive of good sound. This framework encompasses several performance variables, the essence of which can be understood in total harmonic distortion (THD) as a function of both frequency and power. Other parameters are used as well, but it is easiest to explain in terms of THD. Ideal system response within this paradigm can be stated in terms of several objectives. First, THD should be uniform as a function of frequency over the audible bandwidth. Second, THD should increase smoothly with increasing output levels, and its spectral content should not vary with level. And finally, the THD residue should be dominated by the second harmonic. In other words, the model predicts that if measured performance closely matches these objectives, the sonic character of an amplifier will be constant over its entire dynamic range. And, of course, a minimal sonic signature would be imparted to the amplified signal. The signal circuitry layout is dual monaural to minimize channel crosstalk, which explains the duplication of controls for the left and right channels, including dual TKD stepped-potentiometer volume controls. There is no balance control per se; channel balance is adjustable, however, via the relative settings of the left and right volume controls. 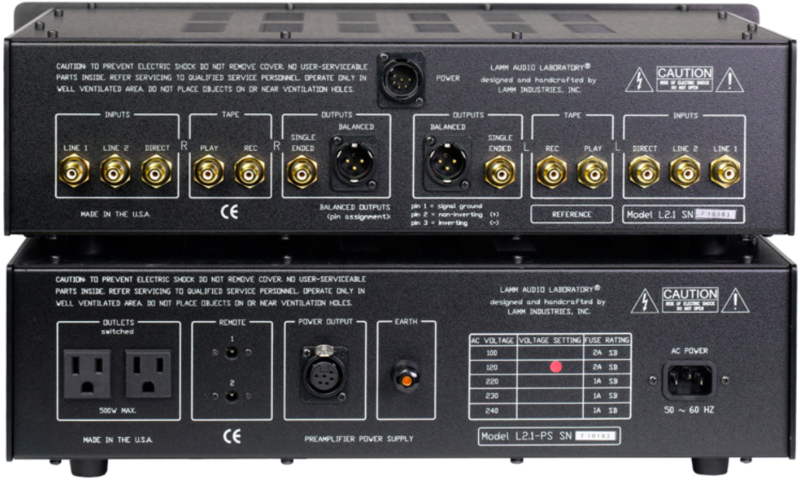 The L2.1 is a bit stingy when it comes to number of line-level inputs. There are three sets of single-ended RCA inputs, although the circuit topology is fully balanced. Output is offered on both RCA and XLR jacks. One input is designated as Direct. It bypasses the Monitor and Selector switches on the front panel and is routed directly to the volume controls. Other features include one tape/home-theater processor loop and an output signal-polarity switch. I find the latter quite useful, though there’s a popular misconception that either the 0-degree or 180-degree phase setting will sound much better. Rarely is popular music recorded in the studio with fewer than 24 tracks, and tracks are usually sequenced and mixed over many weeks with added instruments, voiceovers, and various fixes. In that type of setting there would be a minimum of 24 microphones in the signal path, 24 mike preamplifiers, as many mixing console inputs—to say nothing of compressors, limiters, and other special effects units. The probability that some but not all of the tracks being mixed are in reverse polarity is quite high. That means that a multi-track recording may be a mixed bag, with some instruments in absolute polarity and some in reversed polarity. Thus, there may not always be a clear-cut choice between the available polarity settings. An electronic protection circuit mutes the outputs until the preamp has stabilized after being powered, and in case the AC line voltage drops or is interrupted. A design goal was low output impedance. The official spec is 130 ohms over a wide frequency bandwidth, which means that the L2.1 is able to drive long capacitive interconnects with no sonic degradation. This is a significant benefit in my system which uses long runs to the power amplifier.